At Trump's request, Speaker Ryan pulled the bill off the House floor Friday. In the first big blow to the Trump administration’s legislative agenda, the Republicans’ plan to repeal and replace Obamacare failed to garner enough support to bring it to a vote on the floor of the House Friday. 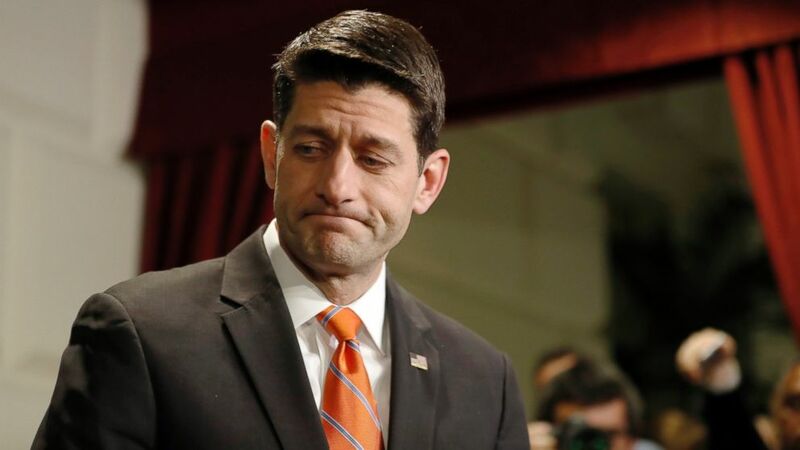 At President Donald Trump's request, House Speaker Paul Ryan pulled the American Health Care Act (AHCA) off the floor moments before a scheduled vote today. Divisions within the Republican Party ultimately led to the bill being yanked. Members of the conservative House Freedom Caucus -- along with a few moderate Republican lawmakers -- planned on opposing the bill if it went to a vote. (Susan Walsh/AP Photo) House Speaker Paul Ryan speaks during a news conference on the American Health Care Act on Capitol Hill in Washington, March 7, 2017. When House Republicans unveiled the American Health Care Act on March 6, they were met with criticism from some conservative groups. 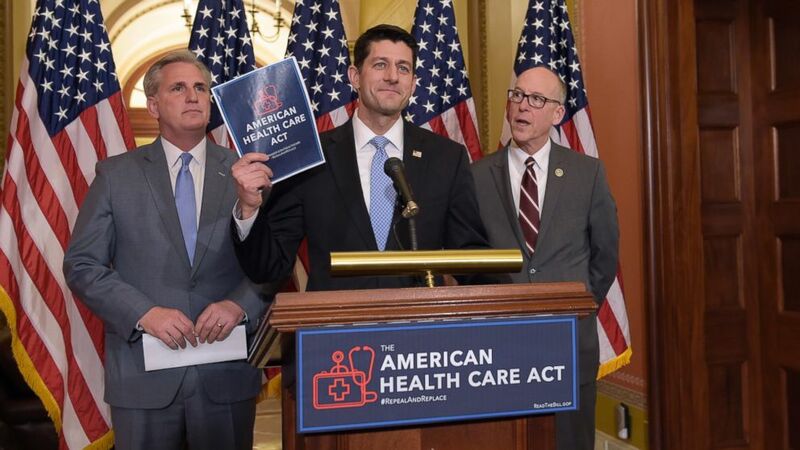 Speaker Ryan, House Majority Leader Kevin McCarthy, and Health and Human Services Secretary Tom Price worked to defend the bill, with Speaker Ryan even holding a PowerPoint presentation to explain the AHCA. 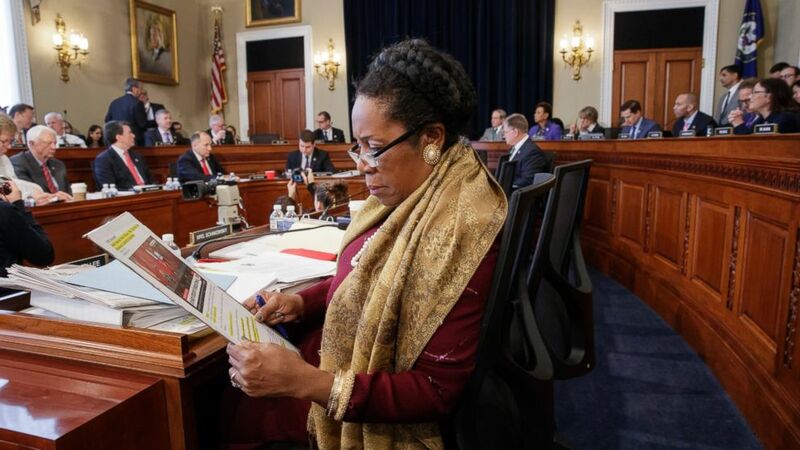 (J. Scott Applewhite/AP Photo) Rep. Sheila Jackson Lee, D-Texas, and the House Budget Committee works on the Republican health care bill, on Capitol Hill in Washington, March, 16, 2017. On Monday, March 13, the Congressional Budget Committee released its report estimating that about 14 million more people will be uninsured next year if the original AHCA were enacted. In the next nine years or so, the number of uninsured would jump to 24 million more, according to the CBO. Following the release of the CBO report, several moderate House Republicans announced opposition to the bill because of the increase in Americans without health care coverage. Despite the CBO report, the bill seemed to be on course as it cleared two hurdles, moving forward with approval from the Ways and Means Committee and the House Budget Committee. A number of tweaks were made to the original legislation in an effort to muster votes. The amendments included changes to Medicaid funding, an optional work requirement for Medicaid and instructions for the Senate to construct a $75 billion fund that would provide additional tax credits to help people buy insurance. 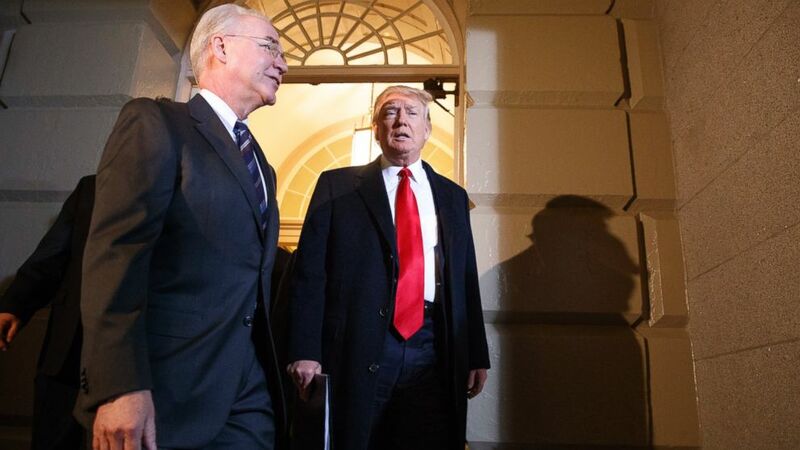 (Evan Vucci/AP Photo) President Donald Trump and Heath and Human Services Secretary Tom Price arrive on Capitol Hill in Washington, March 21, 2017, for a meeting on healthcare with Republicans. President Trump traveled to Capitol Hill to make a personal pitch to House Republicans behind closed doors. For roughly 40 minutes, the president spoke to House Republicans, attempting to convince them they need to pass this health care bill or risk losing their seats in the upcoming midterm elections. President Trump also specifically pointed out Rep. Mark Meadows, the chair of the House Freedom Caucus opposed to the bill. “I’m going to come after you,” Trump warned Meadows with a smile. Meadows later said that he thought President Trump’s comment was made in jest. Rep. Charlie Dent, R-Pennsylvania, leader of the Tuesday Group of center-right Republicans, announced in a statement he’ll oppose the bill. Several moderate House Republicans later gathered in Speaker Ryan’s office. The Freedom Caucus met twice during the day, in the afternoon and evening, to discuss their position on the plan. Meadows stepped out from the second meeting to take a call from President Trump, telling reporters that the caucus' goal is to hold the president to his campaign promises. "We're still negotiating, we're all trying to get to 'yes,'" said Meadows earlier in the day. (Alex Brandon/AP) House Speaker Paul Ryan departs after announcing the delay of the health care vote, March 23, 2017, on Capitol Hill in Washington, D.C.
House leaders had every intention of voting Thursday on the GOP health care bill, the seventh anniversary of when President Barack Obama passed the Affordable Care Act. President Trump met with the House Freedom Caucus at the White House with no success. Caucus members emerged from the meeting saying they still haven’t reached a point where they could support the AHCA. The president later met with the Tuesday Group at the White House, but at around 3:30 p.m., House GOP leaders postponed the vote on the bill to Friday. The CBO released a revised report noting no major changes to its projections of falling insurance coverage under the plan. It further noted a $150 billion decrease in the amount that the AHCA would reduce the deficit. The House Republican Caucus gathered for one more meeting that day, and President Trump issued an ultimatum: Vote Friday or he'll move on from health care reform. According to sources in the room, White House budget director Mick Mulvaney conveyed President Trump’s final offer to House Republicans. “We have to have a vote tomorrow. He expects it to pass," Rep. Chris Collins, R-New York, told reporters after the meeting. "But he’s moving on if for some reason it didn't." On late Thursday night, the House Rules Committee passed another amendment to the bill. (Evan Vucci/AP Photo) House Speaker Paul Ryan leaves the White House after meeting with President Donald Trump, Friday, March 24, 2017. On Friday morning, the House began debate on the AHCA, expecting a final vote on the bill sometime between in the late afternoon or early evening. Republican members continued to go public with their opposition to plan, including Rep. Rodney Frelinghuysen, R-New Jersey, the chairman of the House Committee on Appropriations. Speaker Ryan arrives at the White House to brief President Trump on the situation. 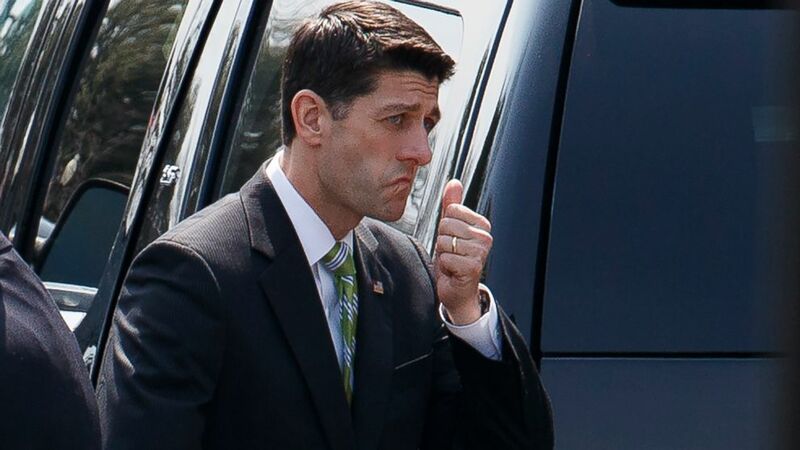 After an hour and 20 minutes, Ryan leaves the White House and heads back to Capitol Hill. President Trump called Speaker Ryan, asking him to pull the bill from the floor. The House adjourned, postponing the vote. It was then that the news broke that President Trump had called Speaker Ryan.